When it comes to household cleaning products I am always looking for things that can get the job done effectively and cut back on my to do list and the time everything takes to get done. And when I read that 20 Mule Team Borax not only will remove stains but can also be used in toilets, drains, and other household things I was thrilled. Yes, that's right it not only is a laundry booster but also a multipurpose household cleaner! The second I found this out, I took the box of 20 Mule Team Borax I received and began cleaning the toilets with it and scrubbing the sink drain! Before I get ahead of myself let me give you the basic facts about Borax. It's a 100% natural mineral from the earth and once it's removed from the ground it is washed, dried, and boxed up for us to use! It's basically sodium tetraborate with nothing added, no chemicals or chlorine. Borax is great if you have hard water because hard water can leave calcium and magnesium granules at th ebottom of your washing machine when you put the detergent in. It basically wastes detergent. But Borax will soften hard water so it protects your detergent and maximizes the ability for it to clean. I added a 1/2 cup of Borax to every load along with my usual Purex detergent. My clothes definitely came out cleaner and brighter this time! 2. I poured it into the toilet ( just about 1/4 cup) then scrubbed it with a brush. The stains disappeared and the typical toilet bowl smell was gone! I used Borax to clean my rat's cage out and after rinsing it thoroughly, was pleased that there was no smell or residue left! oh, and my rattie girl was pleased as well! What an awesome product with so many uses! One winner will get a coupon for a free box of 20 Mule Team Borax! US Only please! 1. Like 20 Mule Team Borax on Facebook here. 2. Leave a comment on their Facebook page letting them know Ask Away sent you! 3. Leave a comment here with your name and email address to let me know you did the required entry! 2. Leave a comment below this post letting me know what you would use Borax to clean around your home first! The giveaway will end on Tuesday, June 28th at 11:59 PM EST and a winner will be chosen via Random.org. would use this to clean out the litterbox! I'll use it to scrub carpets! Love, love, love Borax, I use it for everything! with kids at home I would start in my kids bathroom!!! Liked 20 Mule Team Borax on Facebook and let them know you sent me. I Like 20 Mule Team Borax on Facebook. I left a comment on their Facebook page letting them know Ask Away sent me. I'd use it to clean my bathtub first. I would use borax to clean my bathtub first. 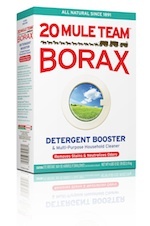 I want to use borax to make homemade laundry detergent that is chemical free!